Our version of the well-known Spanish rice dish originating in the Valencian region. 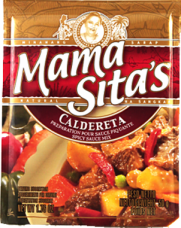 Seasoned with Mama Sita’s Caldereta Mix. In a medium bowl, combine malagkit rice and long grain rice. Rinse and set aside. In a wok or large pan (16” in diameter 4” deep), heat the oil. Sauté the garlic, onion, tomatoes and paprika sausage for 2 minutes. Add the shrimps, crabs, mussels and squid, and stir-fry. When the seafood changes in color, add the rice and mix well. Increase the heat and stir in the water, Mama Sita’s Caldereta Mix, Mama Sita’s Achuete Powder and patis. Bring to a boil. Lower the heat, cover and simmer for another 15 minutes. Add the peas and bell peppers. Cover and cook until rice is done. To prevent the rice from sticking to the bottom of the pan, stir once in a while and add more water if necessary.